“Spiritual formation occurs primarily in the context of community,” reads “A Family Affair,” Biola University’s Professor of New Testament Language and Literature, Joe Hellerman’s article, in the May issue of Christianity Today. The local church community, as an organization of people, is uniquely designed to help individuals test and develop what it means to love and serve one another throughout life. Beating up on the church has become a common sport for some pastors, professors, church growth consultants, and parachurch influencers obsessed with what’s wrong with North American churches. But not for Hellerman. It’s not that he is in denial of, or cannot honestly assess real or perceived problems with the church or her leaders; it’s that he views such matters from the advantage point of the church as a family versus judging it as an individualistic critic. The advantage point of his perspective reflects his knowledge of his own identity: who he is and whose he is with regard to his calling. Hellerman is a professor and scholar. However, more fundamentally, he’s a co-pastor at the Evangelical Free affiliated church, Oceanside Christian Fellowship, and has been pastoring in some capacity for thirty-years. Being a pastor indispensably permeates his public presence, whether at the intersection of his leadership and care among his students and colleagues at Biola or among his local congregation. Hellerman is, quite contentfully, a pastor who is also a professor. His Christianity Today article, “A Family Affair”, resounds with the inescapable perspective of a pastor-professor, which is a perspective that frequently permeates Biola faculty endeavors. Acting with the diligence of a first-rate archaeologist, Hellerman’s article attempts to excavate and recover knowledge of how the early church viewed herself as a strong family. “Jesus’ early followers were convinced that the group comes first,” Hellerman observes. Digging up early church practices and gems of wisdom and insight, Hellerman shows that the individual was understood to be part of a broader familial network of Christian relationships. 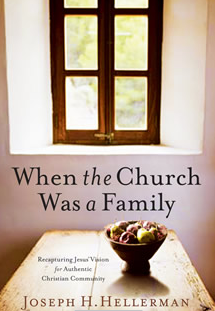 His article is a microcosm of a larger book-length project that was recently released from Broadman & Holman Academic, titled, When the Church was a Family: Recovering Jesus’ Vision for Authentic Christian Community. The book has received endorsements from best-selling authors like Dan Kimball and Scot McKnight. So, how does a 21st century church recover the communal ideals of the early church? The short answer is that one has to learn to put to death an individualistic attitude that relegates the value of the church under the goal of whether or not it fulfills one’s desires and preferences. You can learn more about Professor Joe Hellerman at his blog and at the When the Church was a Family website. Written by Joseph Gorra, Christian Apologetics. For more information, Jenna Bartlo, Media Relations Coordinator, can be reached at (562) 777-4061 or through email at jenna dot l dot bartlo at biola dot edu.